The McGill tie has worked its magic again. 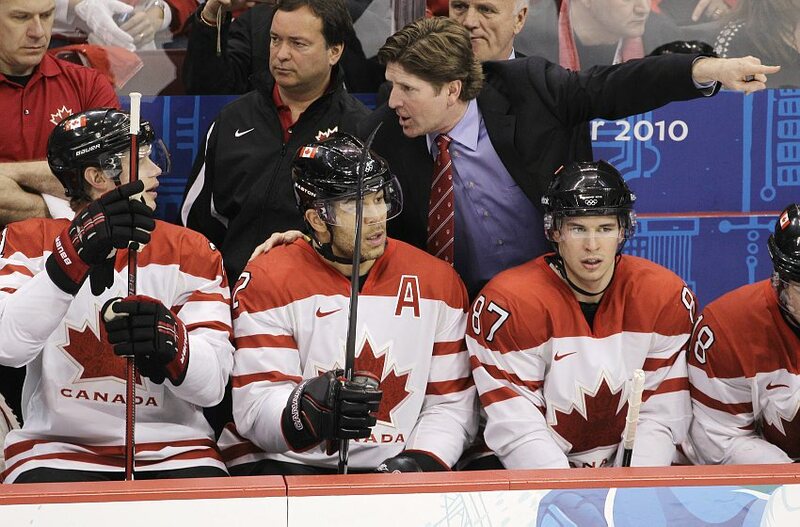 Mike Babcock (BE’86) coached the Canadian Olympic men’s hockey team to a heart-stopping gold-medal victory Sunday night, sporting his “lucky” McGill tie, which now enjoys a 6-2 record when Babcock has it on behind the bench, whether at the Olympics or in the NHL, where he coaches the Detroit Red Wings. Of course, the tie didn’t win, the Canadian players did. All Canada was watching, barely breathing, as the Canadian men scored the country’s record-breaking 14th gold medal at the Vancouver Winter Olympic Games Sunday, notching a 3-2 overtime win against a powerful American squad that never quit. With an almost lyrical inevitability, Sidney Crosby sank the overtime goal that clinched Canada’s victory in a nail-biting game that could have gone either way. A blue McGill tie had been couriered to Babcock several days before the final game but he had already packed his own red McGill tie and chose to wear his trusty old one for what may go down as the highest rated spectacle in Canadian television history. Babcock’s success caps an amazing record of achievement for McGillians at the Vancouver Games. The Games were barely a day old before Desautels Faculty of Management student Jennifer Heil won a silver medal in freestyle moguls skiing. And there were McGillians on the Canadian women’s hockey team, who were presented with their medals by McGill Chancellor Emeritus Richard W. Pound, a former vice-president of the International Olympic Committee who continued to play an important role at these, the third Olympic Games to have taken place on Canadian soil. The women’s hockey gold medals earned by current student Charline Labonté, a physical education junior from Boisbriand, and graduates Catherine Ward (BCom ’09) from Town of Mount-Royal, and goaltender Kim St-Pierre (BEd ’05) of Châteauguay, bring the total number of Olympic medals – Summer and Winter Games combined – won by McGill students or graduates since the Olympics began, to 28. 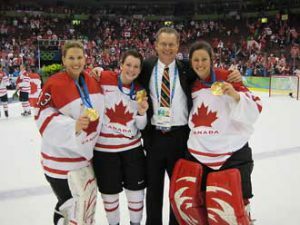 Friday night’s 2-0 victory over the U.S. gave St-Pierre a third Olympic gold medal, while Labonté, who was between the pipes for Canada’s gold medal victory in 2006 (Turin), earned her second. Olympics rookie Ward earned her first, but probably not last, Games medal. She scored 2 goals and added two assists in five games and was a pillar on the blueline for defending Champions. Ward was on the ice for both of Canada’s goals in the gold medal game and helped kill off a number of Canadian penalties. Heil, 26, from Spruce Grove, Alta., was the defending gold medalist in her event and she finished second behind American Hannah Kearney, the daughter of two McGill grads: Jill Gass (BEd ‘79) and Tom Kearney (MA ‘79). Speedskater Tyson Heung (BEd’05), a Montreal teacher originally from Brampton, Ont., skated for Germany, but failed to capture a medal. Eight other McGill graduates were involved with the 2010 Games in coaching or administrative roles. Peter Smith, the current head coach (on sabbatical) of the hockey Martlets, served as an assistant with Canada’s women’s team.